New Delhi: After a gap of over 20 years, Re 1 note has been released in the country and it bears the signature of Finance Secretary Rajiv Mehrishi. Incidentally, the note was released at Shrinathji temple in Nathdwara, Rajasthan, on March 6 by Mehrishi. Other currency notes in India bear the signature of RBI governor. Earlier last week, RBI had said that it will soon put into circulation one rupee currency notes and would be legal tender as provided in The Coinage Act 2011. Alongwith the circulation of new Re 1 notes, the existing currency notes of the same denomination will also continue to be legal tender. The re-launched one rupee notes will be made up of 100 per cent cotton rag content. It will weigh 90 grams per square metre and have thickness of 110 microns. As watermarks, it will bear Ashoka Pillar symbol in the window without words 'Satyamev Jayate', carry a hidden numeral in the centre while hidden word Bharat (in Hindi) will be on the right hand side of the note. The colour of one Rupee Currency Note is predominantly pink green on obverse and reverse in combination with others. On the obverse, the note carries bilingual signature of Mehrishi. 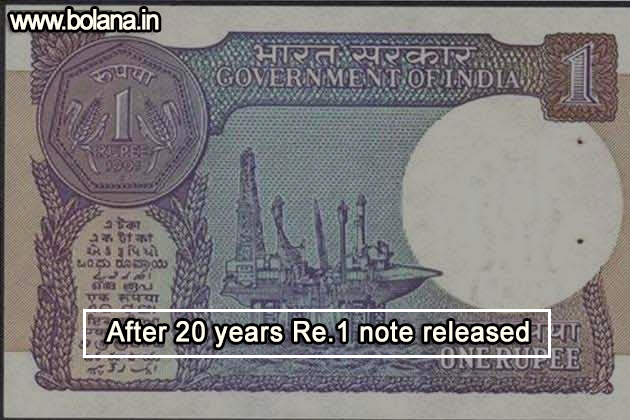 In November 1994, printing of Re 1 note was stopped mainly due to higher cost and for freeing capacity to print currency notes of higher denomination. Printing of Rs 2 and Rs 5 notes too were discontinued in 1995. Since then, only coins have been issued for these denominations.